Sir Francis Bacon certainly wasn’t thinking about a popular television show when he coined this popular phrase centuries ago, but Lost proves his assertion that knowledge is power, week in and week out. Since the first episode, knowledge or answers have bartered or paid for and even valued above personal safety. Sayid reverts to his skills of torture in an attempt to pry information out of the “other” they’ve captured (which we later find out is Ben). Two weeks ago, Kate moved one of Locke’s captives and allowed him to talk to Ben, in exchange for the knowledge of whether the people on the boat knew about her past. This week, Locke granted Ben his freedom (for being a leader he sure is held captive a lot) in exchange for, you guessed it, knowledge about the island and the people on the boat. And if those examples aren’t enough for you, just think about one of the reasons we keep coming back week after week… to learn the answers to the show’s countless puzzles. People always ask what the secret to success in blogging is, and really it’s fairly simple. Readers have to believe they will receive something in exchange for their time spent reading your blog. In some instances such as humor related blogs, that something might be entertainment. However, more often than not, readers are looking for information, for understanding, for knowledge. The key to generating a loyal readership is convincing visitors to your blog, that you have the knowledge they’re looking for and that you’ll give it to them in the content of your blog. Whether you’re an expert in your field, a rising star, or just starting out, the principle is the same, knowledge is power, even in blogging. Early in the plot line, the writers of Lost began creating small and sometimes seemingly insignificant connections between the characters. For example, in a flashback about Sun, we see Boone and Shannon in the background. As the show progresses, the connections become deeper and deeper. We find out that the man who swindled Sawyer’s mother and destroyed his family is in fact John Locke’s biological father. We discover that Desmond met both Jack and Charlie before they wound up on the island. And, perhaps the biggest surprise of all, we discover that Jack and Claire are siblings! 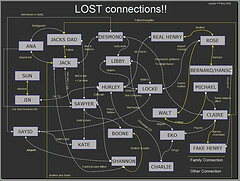 While the connections in Lost are used to further intertwine the characters and weave an even more complicated web between them, connections are also critical in blogging. Networking with other bloggers, no matter what the niche is crucial. Guest posting, cross promotion, reaching new audiences, they all depend on creating connections in the blogosphere. There will come a time in the life of every blog where the growth will begin to plateau. Eventually everyone in your circle of influence will have been exposed to your content and growth will begin to stagnate. The key to expanding even further, is to put yourself in front of new audiences. The beautiful thing is, often times, ideas, concepts, and tactics that seem very basic to you, might be groundbreaking news to the new audience. Many of my posts about SEO here were not all that advanced and probably wouldn’t have been seen as useful if I had written them on an SEO blog. However, since SEO is not the specialty of many of my readers, they find these posts incredibly useful. If you write a sports blog, take a crack at guest posting on a political blog about the recent steroid hearings on Capital Hill. If your blog covers TV shows, write a guest post for my Lessons on Blogging series. 😉 That’s probably plenty of examples but the point is, take the time and energy to create a few connections in the blogosphere. I promise, you’ll be glad you did. 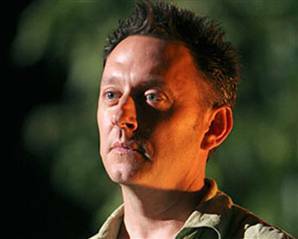 The use of flashbacks has become a signature of Lost. Through the first three seasons, each episode focused on the history or “back-story” of a single character. In between keeping track of events on the island, viewers are given quick glimpses into each character’s life before the island. These flashbacks help immensely in filling out the story line and educating viewers about the different characters. At times, they’ve even revealed surprising information that even the characters themselves don’t know. It’s through a flashback that we learn what crime Kate committed, we learn how Locke came to be in a wheel chair, and we learn how Desmond wound up on this particular hunk of rock in the middle of the ocean. Without these flashbacks, character development would have been extremely difficult and one dimensional. Likewise, providing background information or a brief history of yourself and your blog is often crucial. If you proclaim to be an expert in your particular niche, but don’t provide any data or information to help back that story up, visitors will be limited to judging your blog by their own perceptions. Imagine if Problogger Darren Rowse never let you know how he came to be a professional blogger. Or better yet, imagine if John Chow never revealed the income he generates from his blog. In the anonymous online world, would you have any reason to believe their claims? Without proof or some history, claims made online are just as likely to be made up and fake. On a personal level, disclosing more of your personality will also endear readers to you. While you don’t want to take this too far, allowing your readers to get to know you will convert visitors to your site into loyal followers. I can’t tell you how many times people have commented to me on my about page. The fact that I state that I’m not a dot com mogul or some type of guru, and don’t pretend to be, makes visitors more comfortable and makes me stand out among the crowd in the make money online niche. Don’t get me wrong, I have work to do in this area as well. Several people have asked for me to provide a brief summary so they can catch up on my journey towards a full time income. And really, that’s exactly the type of thing I’m talking about. Laying just a little bit of foundation, you can give your blog a much more personal feel and allow readers and visitors a feeling of that much more connection and loyalty to your blog. Towards that goal, JJ Abrams and Damon Lindelof compiled what’s known as a series “bible” which reportedly outlines all the island’s many mysteries. Hopefully this will include explaining the smoke monster, the polar bears, the numbers, the magnetic fields, the others, etc etc. Basically, the book is meant to act as a road map and keep the series on course. While I’m not suggesting you need a “bible” for your blog, it is important to know where you’re going. Most blogs are started with a goal in mind, to make money, attract readers, promote your work, pump up your public profile, whatever the case may be. Unfortunately, blogging is rarely a straight path from point A to goal B and at times it can be so convoluted and confusing that you feel… well lost. Taking the time to create a plan for your blog and it’s success, or carving out a period of time to schedule a strategy session with yourself, is often all it takes to help make sure you know where you and your blog are headed. Included in these plans or strategy sessions should be things like how you’ll monetize your site (if that’s your goal), how you’ll promote it, and perhaps most importantly of all, your end-game. Do you plan on selling your blog, do you want it to become a self sustaining resource, do you want to leverage it into a book deal? The end game is critical and if it’s not executed well, it might jeopardize everything you’ve put into it up to this point. Let’s just hope the writers of Lost know this as well. Even though this was a two part post with 7 different lessons on blogging, Lost is an incredibly complex show and I’m more certain than ever that I’ve missed some other very good lessons that bloggers could learn from it. When (not if) you notice one that I’ve omitted, please share it in the comment section below. Great post! I love lost! Sometimes I feel “lost” when watching it, like when writing posts sometimes. I love how the show has the previous episode on before the new one each week with “clues” and “hints”. It definitely opens up a lot of information that I wouldn’t have noticed. I wonder if something like that can be done with a blog. Anywho, keep writing awesome and entertaining posts! Jack and Claire are siblings!?!?! Really? Damn, what season is that? Bloody UK, we’re behind you lot…. I agree with the comment about knowing where you came from and providing background. This is something that I do a lot of, perhaps too much. I am a very personal blogger and I talk about myself a lot – (this is one of the reasons I don’t guest post) and I think it helps readers understand that I am a real person just like they are. No…a spoiler!!! I shouldn’t have read that. Great post by the way. Breaking the posts into two parts is a great way for return visits. I haven’t watched “Lost” because I missed the whole first season and I didn’t think I would “get” it. I didn’t know it would make me millions in blog dollars! I think I need to pick up a DVD of Lost and spend a weekend catching up. Added you to my feed and I’ll be back. Great post Ben, touched on alot of the important aspects of the show, and how they pertain to us bloggers. Only thing I didnt see that I felt should be included is the fact that on the island, everyone is given the chance at a new beginning, a new life, much like the internet gives us the opportunity to do. This is a major reason I blog, as it gives me a chance to speak whats on my mind, without judgement based on my past mistakes and tribulations. And if I do feel like sharing mistakes I’ve made in the past, or airing out my dirty laundry so to speak, I usually get positive response from people in the same shoes, rather than the dirty looks and closed doors I’m used to in the real world. Much like Jack didnt care to hear Kates crimes, the internet is more forgiving it seems, like the people on the island, learning to live with each other and get past each others quirks and problems. making connections is the best one. Ben is one of the better bad guys on TV. @Silvano, that’s a FANTASTIC point. Locke was given a new start (one could argue several new starts actually) as were Kate and all the rest of the survivors. As you said, the internet allows you to start over or even be someone completely new if you have the desire to. Wonderful addition to the list. Thanks very much for your input. I love that show, this was an entertaining post. LOL! Great job on using my favourite TV show as an example for good blogging conduct. One of the best shows ever made! The story is just great and of course so is Evangeline Lilly.